Austrian, Scots, Red and Ponderosa Pines. New shoots do not elongate in the spring. They appear brown and stunted by June. Recent research suggests this fungus sporulates all year round. 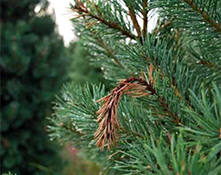 Needles of diseased shoots are stunted and straw coloured and have patches of dried resin near the base. This disease is more severe on drought stressed trees. This fungus is an opportunistic pathogen that can live as an endophyte in healthy tissue and a saprophyte in dead tissues. The fungus overwinters as pycnidia on cones, diseased shoots and branch cankers. 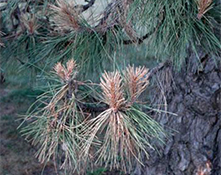 Spores ooze out of the pycnidia during wet periods and infect new needles in spring. The fungus can be spread by pruning tools. Replace severely infected trees with resistant species. Pruning may be done to remove infected twigs and cankered branches to improve the trees appearance. 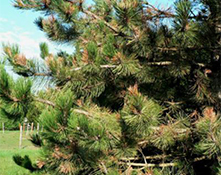 Since the fungus also overwinters on cones, it is not likely that pruning will stop new infections. Prune only when the foliage is dry and disinfect tools frequently during pruning or wait until late fall or winter to prune. Fungicides should be applied beginning when buds develop in spring until candles are fully expanded. Keep trees watered during periods of drought, but avoid overhead irrigation.